The drought monitor represents a synthesis of weather- and climate-related indices and impacts, gathered by federal and academic scientists, for monitoring and forecasting broad-scale drought conditions in the United States. The information is presented as a weekly summary (text) accompanied by an interactive map that shows conditions for the whole country, geographic regions, and individual states. The map is color-coded to show intensity of drought conditions and marked to delineate dominant impacts (agricultural or hydrological). Monitoring data is also available in table form. 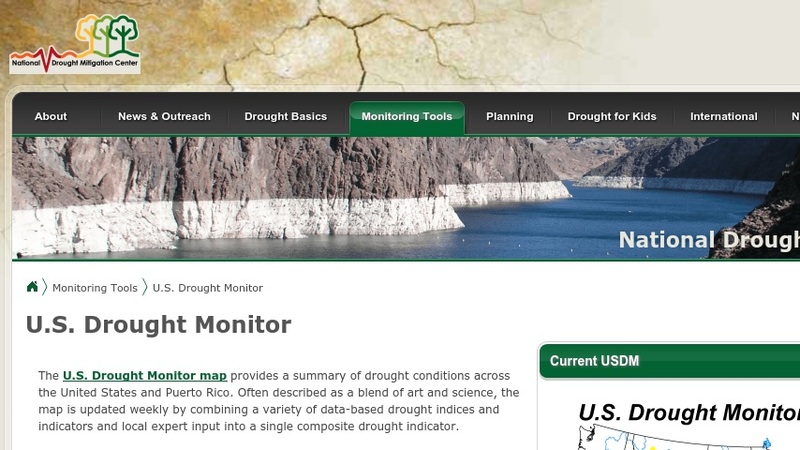 Other materials include animations of the previous 6 and 12 weeks of monitoring data, short- and long-term maps of indicator blends, and the Drought Impact Reporter, a map that shows reported drought impacts over a specified period of time.